Don’t you love getting letters in the mail? Happy day! You have mail. Take a seat and savor each word as you open up hope today. I’d be happy to read you this post, click here. Guess what? I’m talking to you about hope again. It looks like you’ve forgotten about the lasting promise that is within this real thing, called hope. I know things look grim. I understand that you feel small. I see how you waver in the waiting times. Fear lies deep and you believe it more often than you turn to Me. And this makes you sad and Me too, but child, I am not done with you! I declare that there is HOPE. Look closer, it’s there. It might look camouflaged—masked by hedges and shrubs, but hope is there, found where I am. Dig a little deeper, beneath the surface, and see. It might be covered in dirt in the wake of rubble and ruins but it is present, not dulling with age. Even when you feel you’ve lost it, look for it, like buried treasure; it’s waiting to be discovered and held close. Look up instead of down and find it resting above, secure. Lasting hope is found in Me, belongs to Me, is kept by Me for you. Hope rises and you are changed because of what it brings to the mundane, how it sustains through the muck and the change it makes, all the difference. 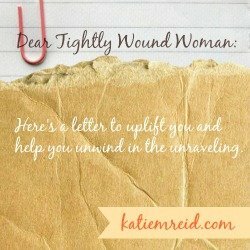 You are wound up, fed up and tripped up by a constant whirring of worry and wringing of the hands. You want to charge forward, or at least try to take charge, but you quickly lose hope again, because life is unpredictable and misunderstood by your limited view of how things should be. You fear the unraveling because you wonder if I can handle it all, the fall, this falling apart. I get you. I understand the wrestle, the stumbles, the here-we-are-back-at-the-beginning feelings. Remember, I wove you together and I hold you together. I’ll keep gently, yet persistently, telling you this until it sinks down from head to heart—until it works its way into the fiber of your being. You: the being I stitched together with care and affection, and sang over before I brought you forth. Look up, hands up high and move. Go on, I am with You. And in Me YOU HAVE HOPE! And oh, how you are Loved. Take the next step in confidence, with it, with Me. P.S. Linking up with Kelly for the #RaRaLinkup, Jennifer for #TellHisStory and Holly for #Testimony Tuesday. P.P.S. Be sure you don’t miss a letter. Subscribe by email (at the top right corner of my site) to receive my words in your inbox as we find grace in the unraveling. 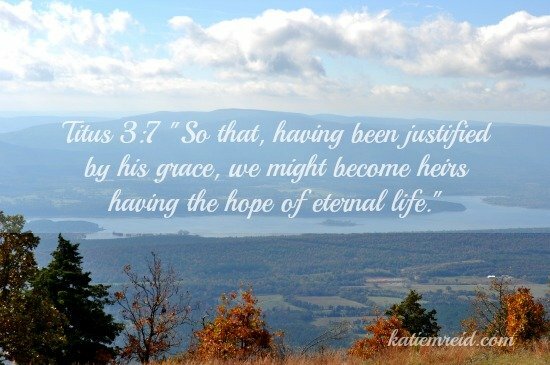 « Unraveling Grace: Not that “Be Still” Thing Again! God really is such a strong source of hope. Thank you for this timely and beautiful reminder. You are welcome Dawn. Thanks for coming over. Happy Tuesday to you! Easy to write, hard to do, isn’t it Dolly? But we press on, hope-full. Let’s look up together Amy. So glad He is the lifter of our head (Psalm 3:3 “But you, LORD, are a shield around me, my glory, the One who lifts my head high”). Thank you for the encouragement Julie! So sorry I have been out of touch. I absolutely love your new site. Thank you sweet Beth. Good to “see” you today. Hanging on to hope every day, Katie! Thanks so much for your encouragement!